Hello! 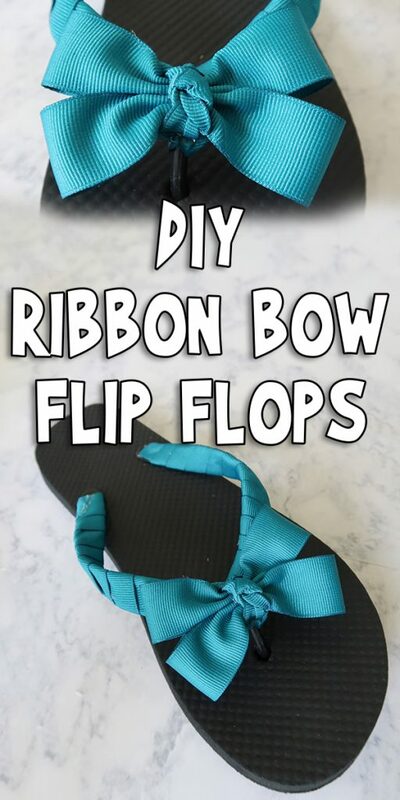 Today I’m going to show you how to make these DIY Ribbon Bow Flip Flops! 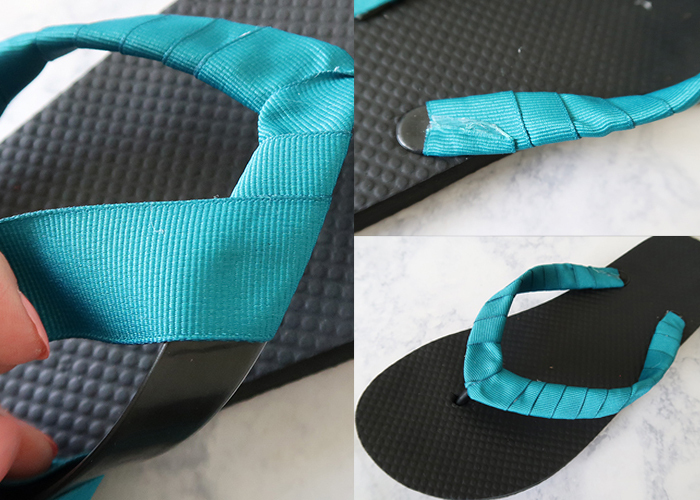 This is a super inexpensive way to make a plain pair of flip flops super cute, and there are no sewing skills involved. Let me show you how to make them! Flip flops. I love picking up $1 ones at craft stores, and they’re really comfy. Please note: Please read all of the instructions before beginning, so you understand the next step. 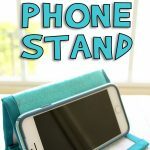 It helps so much in following more complicated tutorials! First, don’t cut your ribbon! Keep it on the spool so you don’t run short. You’ll have the thread the spool under the show straps, but it’s almost impossible to measure the correct length for this project. 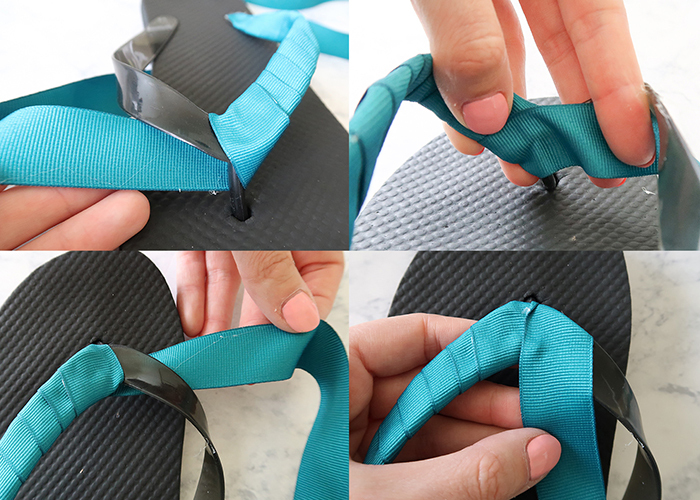 Put a dot of glue on this spot on your flip flops, and put the edge of the ribbon down at an angle. 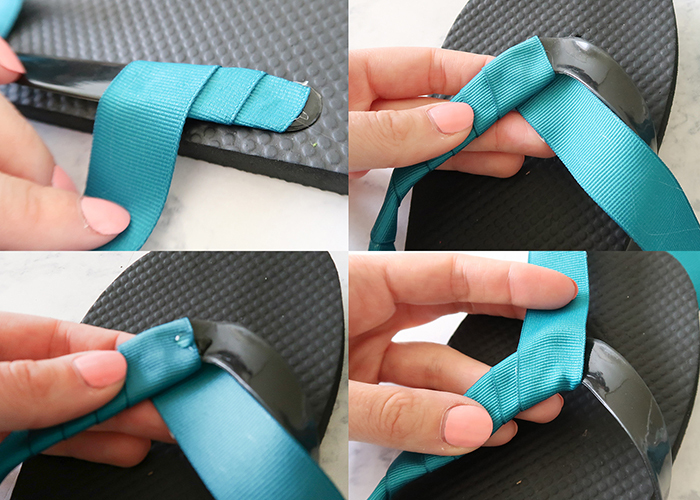 Start wrapping your ribbon around the shoe strap, overlapping the layers and gluing every 2-3 wraps. Keeping wrapping until you get to the center. Place a dot of glue like shown, and wrap the ribbon so it’s pointing towards the toe of the shoe. Pull the ribbon flat underneath the center piece, and place a dot the glue on the back to hold it in place. then wrap it up and around the top of the next strap, and glue it in place. Don’t take the ribbon down the part that goes between your toes, because it will make it uncomfortable to wear. 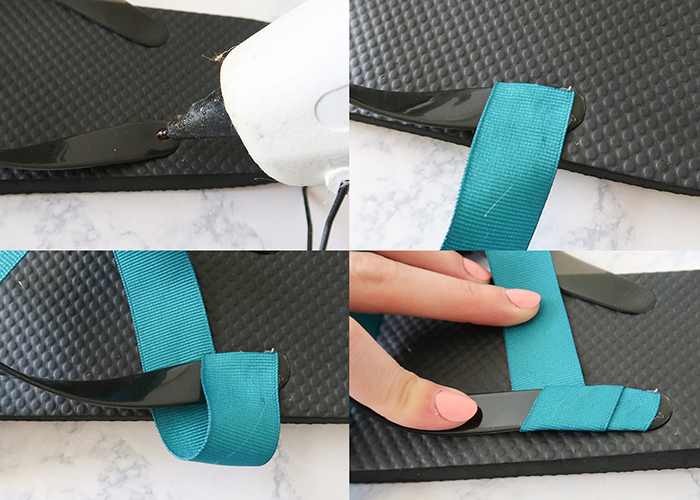 Continue wrapping the second side of the strap all the way down to the end, glueing as you go. Trim and glue the very end, and you’re all done with this part! 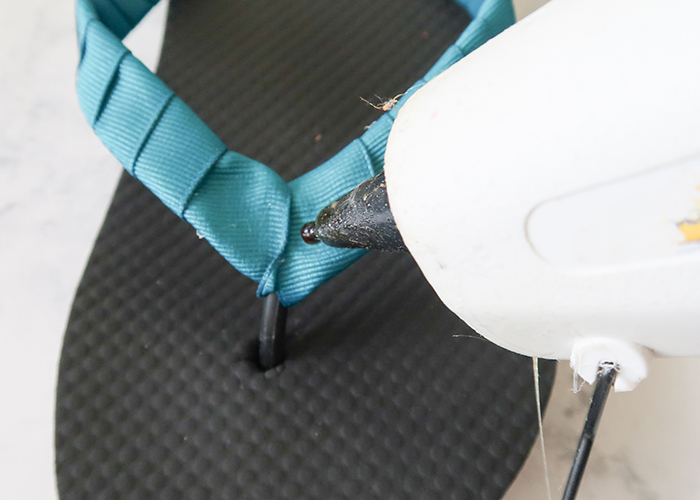 Do this on both shoes. Now let’s make the bow! 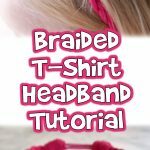 You can use the same ribbon, or a coordinating ribbon. Cut two pieces 7 inches long, and one piece 4 inches long. 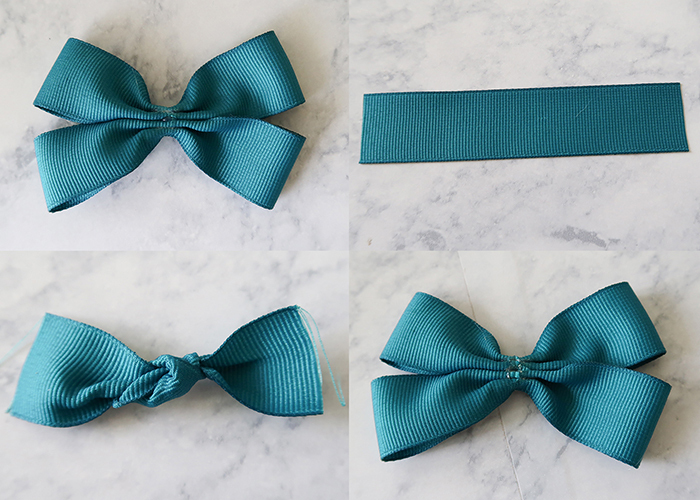 This measurement works well for 7/8 inch ribbon, but you’ll have to adjust it for different sized ribbons to create a full looking bow. 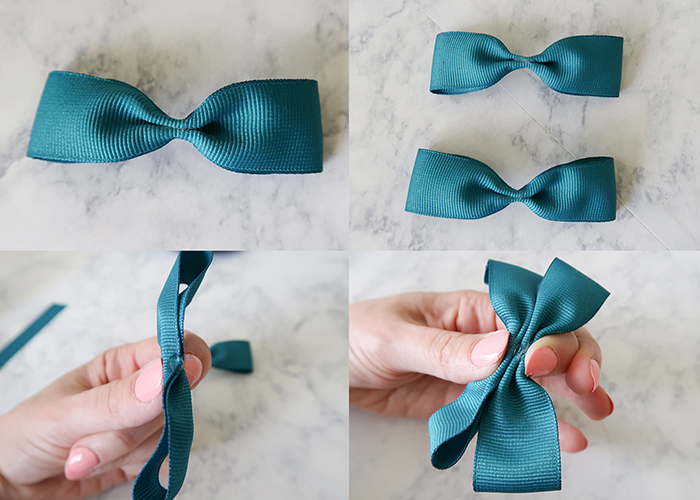 If you’re using thinner ribbon, cut shorter pieces. 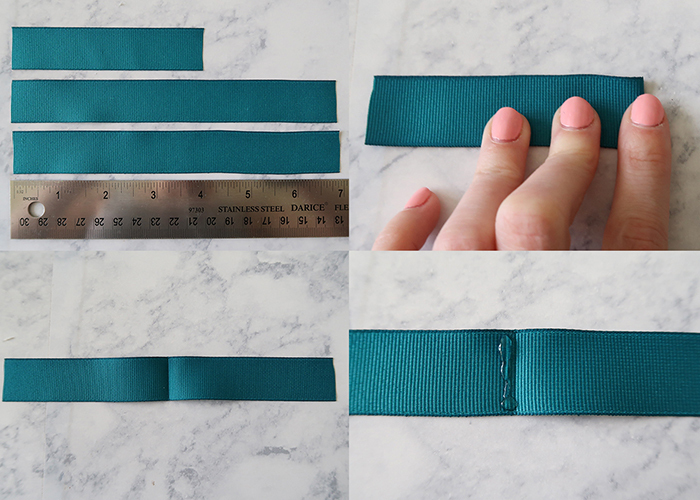 If you’re using thicker ribbon, use longer pieces. Now take one of your 7 inch pieces and fold it in half. Crease the fold well, and open it back up. Place a line of glue on one side of the crease. Fold one side in and press the edge down on that glue line you made. Do the same thing on the other side. The ends of the ribbon should just touch, but not overlap. Now flip the whole piece over so you’re working with the solid side up. Pinch the ribbon at the center, and put a tiny dot of glue in the center. Then pinch the bottom half of the center closed where the glue is. Then it should look like this, with the top half of the center open. On one side of the pinched section, put a tiny dot of glue. Then fold one of the open top half sides down onto the glue. It should look like this. Then do the same thing on the other side. 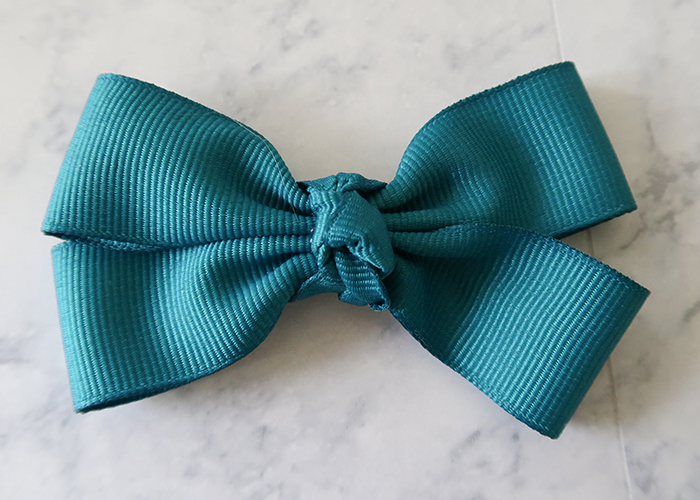 This creates the classic pinched bow shape, and holds it in place! 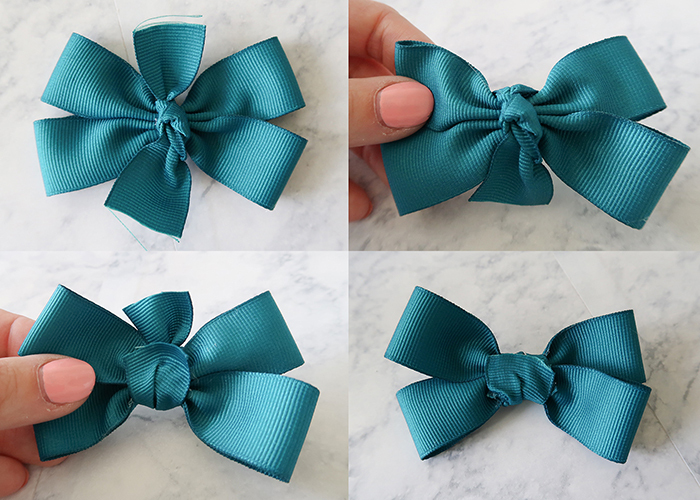 Now take your other long piece of ribbon and do the same thing, so you have two matching bow pieces. 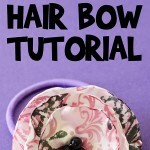 On one side of one of the bows, put a dot of glue in the center. 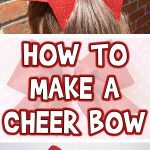 Then press the two sides of the bows together to create one large bow! Here’s the base of your bow! 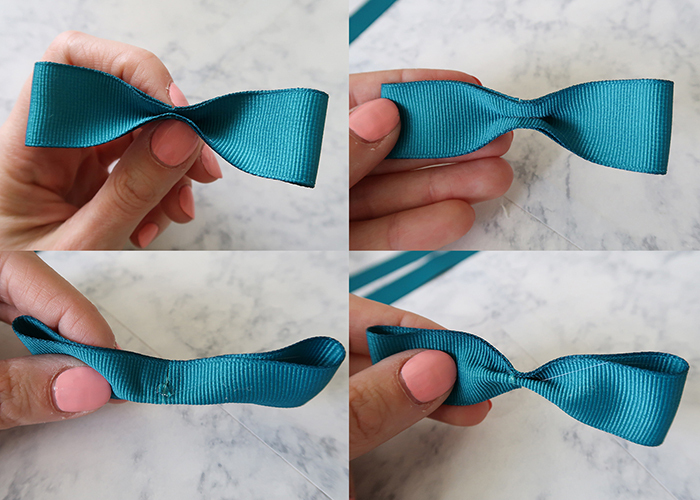 Now take your short piece of ribbon and tie a knot in the center. Place a dot of glue in the center of your bow. Place the flat side of your knot right on top of the glue. Then take on loose end of the ribbon and glue it down to the back of the bow. Then trim the remaining side if necessary, and glue that down as well. 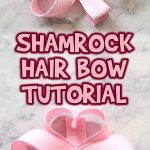 Your bow is all done! 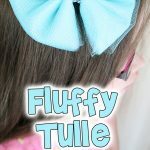 This makes a very pretty and sturdy bow without one bit of sewing! 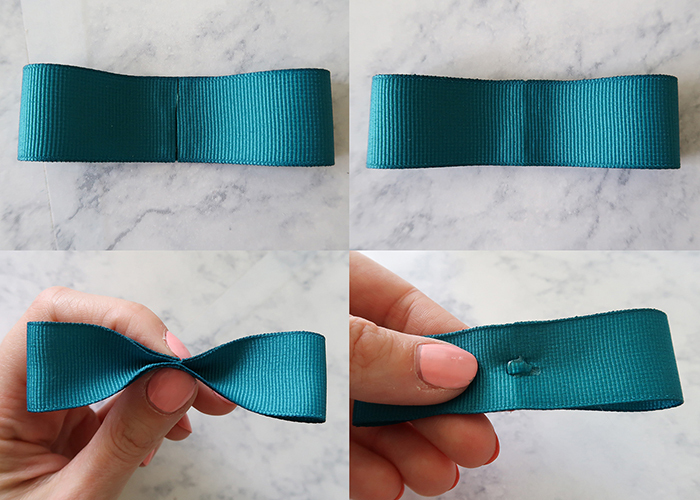 Now place a large dot of glue in the front center of the shoe straps, and attach your bow! You’re all done! 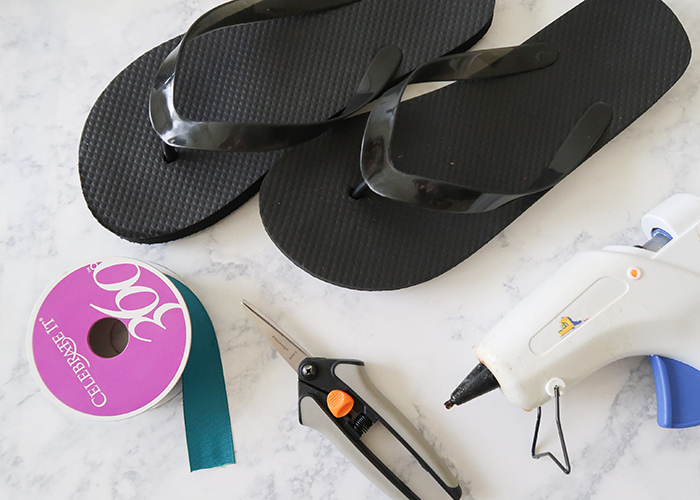 I hope you enjoyed making these DIY Ribbon Bow Flip Flops with me! 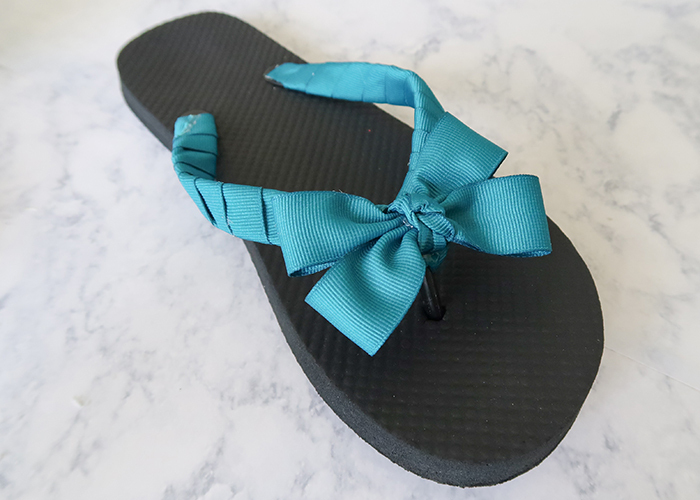 Ages 6-8, Ages 9-12, For Teens, Summer, Wearable Crafts	Joanna Brooks	bow, cute, diy, flip flops, ribbon, tutorial, wearable crafts.